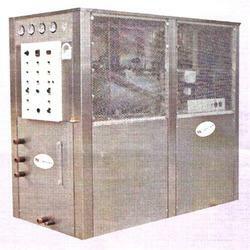 We have emerged as the prominent manufacturer, exporter and supplier of Water Chillers. Offered machine are acknowledged by our clients for their high performance, rigid construction, less maintenance and prolonged service life thereby widely demanded in the global market. These are also available in various specifications and packaging options as per the application requirements of our quality conscious clients. We are a well-known manufacturer engaged in offering Industrial Water Chillers to our clients. Our offered chillers are manufactured by employing most advanced technology. These chillers are highly acclaimed by various industry clients in the market owing to their superior performance, hassle-free maintenance and easy installation. To cater to the ever changing needs of our clients, we are engaged in offering Precision Water Chillers to our clients. Our offered machine is manufactured using high-grade components and advanced technology to match industry laid quality standards and norms. Moreover, we checked this entire range of machines on various parameters to ensure its quality and durability.